You don’t have to spend a fortune to make a glass Christmas display that will make people want to bend down for a closer look. Simply recycle glass bottles, jars, bowls and vases that you already have around to create a Christmas landscape in miniature. Christmas display – I used a family-size glass pickle jar, an old fish bowl, and an over-sized brandy glass. Wash the glass pieces thoroughly and polish them with a dish cloth until they shine. If they are fogged up from too many rounds in the dishwasher, or have old water lines on them like the fish bowl that I used, rub the glass with white vinegar to dissolve the film, then rinse, dry and polish to a shine. Set the glass containers in front of you on a table, then assemble a selection of Christmas figures, figurines and miniature landscape features, including the bottle brush Christmas trees. Play around a little bit with your choices, assembling a few in front of each glass container to get a feel for the scale, positioning and just the “look and feel” of each arrangement. Pour a nice bed of fake snow into each glass bowl or jar. 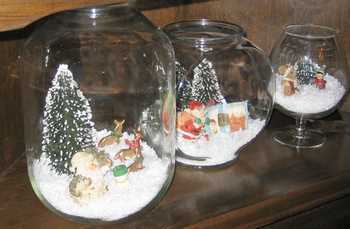 Start placing your chosen items into the snow, assembling a small tableau in each container. You’ll likely find that some of the figures or ornaments fall over as they settle in the fluffy snow; if so, take them out and embed them in a base of plasticine or modelling clay. You should form the plasticine into a larger base than that on the original ornament, as this will add both weight and balance. If necessary, you can push the plasticine right down through the snow, sticking it directly to the glass floor of the container to keep that particular piece in position.